Wordless Wednesday: Spring Training Camp? Hockey Hall of Fame, Toronto, photograph BDM March 2010. First or Second Day of Spring? Saying something about your own blog is pretty boring. It’s not exactly real *yawn* writing. So why would I do that? Because family historians and Geneabloggers have a compulsion to mark all sorts of anniversaries. Like three years it’s been ( ... the usual yadda about time flying). Break out the mojitos, eh? Little did I know thanks to C3 at the time that I would find a kind of writers’ heaven. Even at my slow pace of absorbing the events around me, I did become aware that a trillion other bloggers were also finding writers’ heaven. Finding the ones that truly inspire and amuse takes an age of wading through “recommended” or “blogs I follow” and Facebook fluff. So many to read. It could be a full time job. Oh how I envy those who are so articulate, so funny, who said what I wanted to say so much better! I’m not referring to strictly genealogy blogs. Fellow Geneabloggers, I love you and appreciate all the news you impart, the carnivals you support, the problem-solving you demonstrate, the whimsy you recount. We also need the sustenance of poking fun and laughter. So far I feel comfortable posting the so-called back stories of my family histories and related material. On the other hand, I feel a dichotomy with my other passion of travel. Maybe a travel blog or a camel blog should be separate. They would not have as frequent posts as I would like! But I will be reconsidering the idea. My memoirs have gone by the wayside as I adapted to blogging. Memoirs once prompted by one of the Cs. My chronicle had reached teenage years ’round about university entrance time. Not that I propose to blog the modest secrets of a nameless private girls’ school in Winnipeg on the Assiniboine River or anything else of an imprudent nature, mind. Not that I propose to blog bits of memoir at all. Just saying, it behooves family historians to tackle autobiography. You can do the same for Mom and Dad while you’re at it. Amusement and humour keep us lively while we live. Let’s try for more. A post last September referred to my struggles to understand an unfamiliar source: the Quebec Land Register system. My descriptions had some ineptness due to an anglo-centric perspective and semantics. Writer and researcher Sharon Callaghan, who has hands-on experience, kindly shared some further clarification about accessing the online records. Items in the older post have been corrected. Quebec Land Register refers to the entire cadastral system and its variety of component documentation. The actes, or full notarial entries, are now digitized as far back as the oldest cadastre system. Brenda corrected her blooper (BLUSH) for Index des Immeubles. Immeubles = immovables, i.e. real estate. Meubles = furniture. I knew that! I doubt anyone wants to waste time on the furnishings of a registry office! Meanwhile ... accessing the digital materials is what genealogists and family historians want to do. To have a go at searching the online database, the Quebec ministry responsible for the Quebec Land Register is Natural Resources (and choose English unless you are proficient en francais). I would show a screen shot, but blogger does not like .jsp extensions ... woe is moi. 1. Read all the information provided in various sections on the website. 2. Identify the cadastral number of the lot you want to search. Steps 1 and 2 should be acted upon conjunctively. 3. Make sure your computer meets the specifications (outils requis) and downloads indicated on the site. At the home page, click on Land Survey was at the bottom of the page. On the next page, click on Land Register of Québec on the left. Then read the information options on the left before you proceed: they are in English (as you go deeper into the site, you have to work mainly with French). An important initial option is How to Consult with its numerous links, especially Procedures and also Consultation Tools. Take your time—there is much information to absorb for a technical dunce like me! Remember, Quebec is divided into circonscriptions (divisions) and then cadastres (districts), each of the latter having a series of lot numbers. The cadastre number is your KEY for accessing all options in the Land Register, before trying the database search. The site does have municipal contact information (Répertoires des municipalités du Québec) but of course they are concerned only with current addresses for tax purposes. It’s up to you to obtain relevant material about the ancestor’s historical location from every resource at your disposal—old maps, local histories, etc.—so you can determine where that location fits into today’s division and district. You will not find success with the search engine unless you have a fairly updated version of Internet Explorer and then download the two special viewers. The How to Consult page leads to Consultation Tools. Internet Explorer 6.0 is the minimum browser requirement (searching will not work, for example, with Firefox); the free viewer plug-ins are Active CGM (Intercap) and WinZip. You may access information in the online Land Register of Québec without opening a client account, but you must use a credit card for payment and provide some information each time you begin a consultation session. Note that when you choose this method, you will not receive a user code or password, and you will need to print your invoice before leaving the site. In addition, you will be asked to approve a $5 charge at the beginning of your work session. This is a credit card company preauthorization, and you will not be billed for it. Sharon says: “Everything located via a search in the online database is viewable, saveable, printable, etc. Once you see the result of a search, the fee has been charged and it is yours!” Voilà! Et bonne chance! May I add, any further confusions are strictly due to the dunce and not to her advisors. ● Sharon Callaghan is the author of Paths of Opportunity, recently launched by Shoreline Press. Genealogists and family historians, take note that it is “a portrayal of the Irish Montreal experience of one family among many who helped make Montreal what it is today” (publisher’s blurb). The book discusses community social life and the places, institutions, and events our ancestors would have encountered. ● Gary Schroder is the president of the Quebec Family History Society and a well-known speaker on genealogical records in Quebec and the British Isles. Gary will be giving presentations on Quebec research at the Conference of the Ontario Genealogical Society in Toronto in May. Four major lists of Coll residents exist to inspire the thankless crazy-making task of trying to link generations. Three of them name only the adult male population, but even those slim pickings have value and will be blogged about later. Dear reader, your comments are invited. Dear relatives, a gold star for those who read to the end. In one of those serendipitous turns of fate, we have a complete census of all Coll residents, recorded in the fall, and completed in December, of 1776. The list was barely mentioned in an earlier post. That year, a new assistant minister, Mr. Charles Stewart, arrived to serve the island. His immediate intention to assess the population resulted in what is known as the Catechist’s List whereby each household on every farm or toun was examined for their familiarity with the Presbyterian Catechism. The results were recorded in the kirk sessions book which had lain dormant since 1735. Ages of the people were not given. But the first names of children under the age of seven were shown in a separate column because they were deemed too young to be tested on the articles of faith. Therefore it is possible to make some broad reconstitution of a family for that year. Most often, Mr. Stewart added a brief helpful word for “strays” to denote extended relationships or positions in a household: “his fr in Lw,” “his stepson,” “her mor,” “servant,” and so on. Married women were entered with their birth surnames, as per the Highland custom. Leaping forward for one moment: My Donald McFadyen (born ca.1773 if his age on the ship's list is fairly accurate) had six known sons, among whose names will almost certainly be the forenames of his father and grandfather. I refer to him as Donald the soldier to distinguish him as an individual among other Donalds. The place names on Coll associated with my Donald, thanks to intermittent baptismal records, were Toraston and Cliad. In birth order his sons were, with baptismal or birth years in parentheses: Lachlan (1798), Angus (1801), Roderick (ca.1802), Hector (ca.1809), John (1816), Donald (ca.1818). The first Angus apparently died young and the name was again given to the last child in 1819. If we accept as substantially valid the Highland naming custom whereby a couple named four of their children after their parents—and there is enough evidence the tradition played a large part in our relatively enclosed or isolated island community—then we have ancestral clues. Truth is, we have little else to work with in that era. The naming custom posits that the paternal grandfather’s name would be among the first two sons’ names, frequently the first. Returning to the eighteenth century again, there were eighteen McPhaidens on Coll. One of those male names in 1776 would in all probability be Donald the soldier’s father. In 1776 our Donald was approximately three years old. McPhaiden candidates who had a young (under the age of seven) Donald among their children were Duncan at Grimsary, Lachlan at Arnapost, and a third un-named man whose widow was Mary at Totronald. Is it going to be an insurmountable hurdle to identify his parents? With naming customs in mind, Duncan is not a forename used in Donald the soldier’s immediate descendants. And it was a name hardly to be ignored among descendants because of its early McFadyen origins on Coll. Unfortunately the widow’s deceased husband is a blank. Apparently he died prematurely, leaving three under-aged children. While these two candidates can’t be entirely eliminated, Lachlan McPhaiden of Arnapost may be the prime suspect as our Donald’s father. ● If a couple only have young children, chances are good they are still reproducing. ● A household with four children under seven (there are many) could be configured with the oldest at a maximum of seven, while the youngest may be from newborn to about two years old. A rare household has five youngsters, which I believe accounts for twins, although there are no such notations. ● If a couple has only children seven and over, they may be in middle age, past their reproductive years, and the youngest child could be seven or any years older. ● If a married couple in a single household has no children, it’s likely they are elderly or newly married. ● If the couple has a mixture of children’s ages, more analysis is needed of the over/under numbers. Mary, Marrion, and Donald were born before 1776. After 1776, born to this couple were John, baptized in 1784 at Ardnish, then a second John in 1786, then Cirsty in 1789 at Freslan. You can see a puzzling gap between the young Donald in 1776 and John in 1784, although who knows what potential absences might be somehow accounted for. Yes, they all have the same mother. Very few burials are recorded in Coll records. I’d say the names Donald and John were important in this family too, indicating close paternal or maternal ancestry. Donald was the sole child of this household in 1776. He certainly appears to be the first born, so the couple were likely young. Our Donald the soldier named his first son Lachlan. Other children born later, all at Arnapost: Neil in 1777; Allan in 1782; Lachlan twice in 1784 and 1786; Mary in 1788; Marion in 1791; Kate in 1794. Mary, baptized in 1788, could be the purported sister of Donald the soldier, who married Lachlan Kennedy in 1819 and came to River Denys in Cape Breton. Like our Donald, she had a son named Lachlan. The rest of the male naming pattern here, e.g. Neil and Allan, are not names appearing down to the grandchildren of our Donald. Mary had a son John over the age of seven and three children under: Ann, Donald, and Flora. I suggest approximate ages of John as eight, Ann six, Donald four, and Flora two. They are all familiar forenames in Donald the soldier’s family. Not knowing the deceased father’s name is a monumental disadvantage. One could speculate that the paternal McPhaiden grandfather was called Donald or John. Parish marriages have no record of a Mary McPhaiden of Totronald marrying again after 1776. There is no evidence of a birth/baptism in 1777, in case Mary was pregnant at the time of the list. I raised the question whether McPhaiden was the married or birth surname of mother Mary, i.e., were her children actually McPhaidens? All married women on the list have birth surnames. If McPhaiden was not Mary’s married surname, then this family can be eliminated. Much of the evidence in the list regarding widows seems to support a married surname when young children are living in the home. However, the list is ambiguous: for example, widows Catherine McPhaiden at Uigg, Marrion McCasgie at Torraston, Marrion McLean at Bouste, have several children over the age of 7 with a different surname. Eminent historian Dr. Margaret A. Mackay, Director of School of Scottish Studies Archives, University of Edinburgh, commented that it would likely reflect the habit of the list’s compiler, rather than any prescribed usage. She added, “My gut feeling, if I can call it that, is that the surname used with “Widow” would be the married surname. In community usage (especially when populations were rising) I think it would become confusing to retain a woman's birth surname once she was widowed ...”. The jury is still out regarding Donald the soldier's parents. J.L. MacDougall, History of Inverness County, Nova Scotia (1922; reprint Belleville, ON: Mika Publishing, 1972), 488. Margaret A. Mackay to Brenda Merriman, email correspondence, 4 December 2009. The 27th edition of the Carnival of Central and East European Genealogy invited us to “Explore the Village of My Ancestor.” Need it be said, this is a challenge for descendants lacking a particular language among other important skills? Plus, how many villages have a written history? Nevertheless, let’s plunge on and see what happens. My choices were a toss-up between Kastran or Lade in Latvia—the closest villages to my two ancestral farms. When briefly in Riga on a restricted schedule, I had enough sense to pick up a copy of Arvīds Plaudis’ A Trip Around Latvia (Riga? Jumava, 2002). I decided to go with Kastran, home of the Freibergs, because I have a relative still living there whom I’ve never met. And because according to Plaudis, Lade has no historical, architectural, cultural, or otherwise significant redeeming feature to rate a mention. I wonder if that’s why the Jurikas family all moved on elsewhere (... oh please, you know my Canadian humour conflicts with my Latvian sensibility!). Now, to pad out stuff about my village I could have googled it. But I wasn’t willing to wade through a hundred pages of dubious portals and the usual social networking sites that always offer “everything you need to know” or the occasional carpet manufacturer. Yes indeed, there are people with the surname Kastran. If one uses the proper spelling of Kastrāne it might be darn near the only place in the world without a Wikipedia entry. On the other hand, the place definitely has a lot of hotels and real estate entries so it must be a going concern ... I'd say one of those spots favoured by the rich and famous, undefiled by peasants. Google Earth was worth a try. What I see looks like a farm bordering a small river with perhaps two dozen buildings scattered around. Although I have photographs of the family farmhouse, I can’t recognize the shape of its roof! Then again, this is supposed to be about history. Fortunately I have good maps, so I know where Kastrāne is—about 40 miles northeast of Riga—and how to get there. A Trip Around Latvia gives one specific reference, and I quote: “Kastrāne Castle Hill: On the left bank of the Mazā Jugla, near ‘Grunduļi’, similar to ‘Lielā vīra gulta’ with its two ramparts bordering the property on both ends.” I am grateful that Kastrāne has some kind of notable monument on a river but close perusal of the pages before and aft do not reveal the mysterious Grunduļi. One notices that although Mr. Plaudis provides excellent small map segments, he omitted the North sign on them. Therefore, on a tour “On foot, By bicycle, By car” as his sub-title reads, one would be juggling a series of maps. So far, not much progress with this village yet ... but surrounding place names begin to resonate. A couple of miles away, Suntaži was where my gt-grandparents married in 1881. 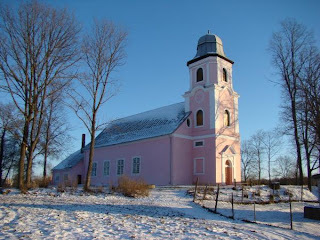 Mālpils, a few miles on the other side of Kastrāne, is where Grandpa Freibergs and all his siblings were baptized in a church built in 1766. Vatrāne is a village named for the vast estate upon which great-grandfather Otto Freibergs held his farm, pre-First World War. Nearby Ķeipene was the origin of some family postcards mailed to Canada; a hill called Jaunķeipene was “a popular gathering place of ancient Latvians in times of trouble.” Trouble, indeed. Centuries of it. The church at Madliena, where I expect (hope) to find earlier Freibergs, dates back to the 13th century (now we’re talkin’!) and was renovated in 1730. It was Madliena where Otto was taken in 1906 and summarily shot for his part in the short-lived reform movement. Several manor houses in the area had been torched in 1905 by Latvian freedom fighters and the large estate owners used police to execute all suspects. Photograph, Madliena Evangelical Lutheran Church, Wikimapia. Google is useful, after all. Now that I’m getting to know the neighbourhood, surely Grunduļi will reveal itself. I have a few lats coins left over from my first visit, probably not enough to rent a car.